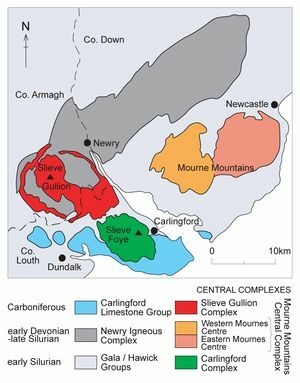 The focus of intrusive Palaeogene igneous activity was located in Counties Down and Armagh in Northern Ireland and in Co. Louth in the Republic of Ireland (P947865). 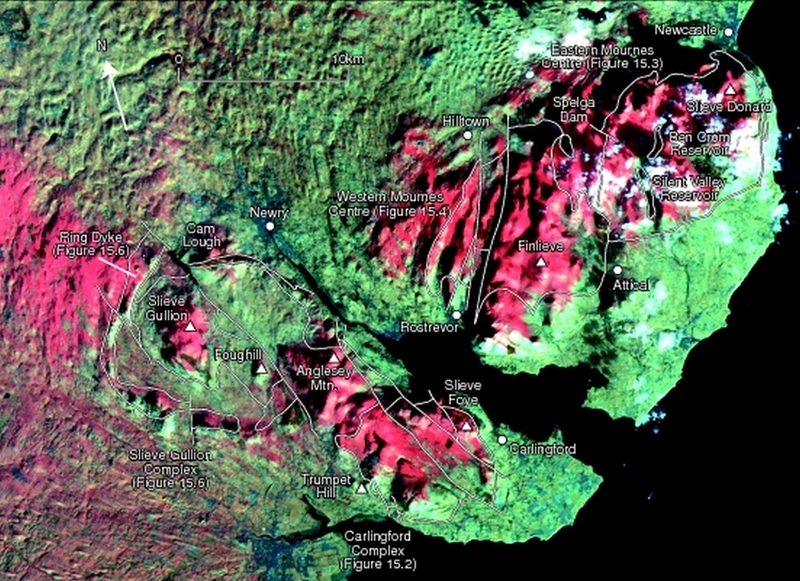 Three central complexes, the Mourne Mountains, Slieve Gullion and Carlingford intrude the deformed Silurian turbidite succession of the Southern Uplands-Down-Longford Terrane. (P948030) The rocks formed at this time were predominantly silicic in composition and included large volumes of granite, felsite and granophyre. However, significant bodies of basalt, dolerite and gabbro also formed at this time in the Slieve Gullion and Carlingford complexes. The regional gravity map of Northern Ireland shows a large positive Bouguer anomaly slightly offset to the north of Slieve Gullion and the Mourne Mountains which may represent a concealed, high density, basic or ultrabasic body . ↑ Carruthers, R M, Cornwell, J D, Turnbull, G, Walker, A S D, and Bennett, J R P. 1987. Interpretation of the Bouguer gravity anomaly data for Northern Ireland. Regional Geophysics Research Group, British Geological Survey No. RG 87/5. This page was last modified on 25 September 2017, at 13:51.